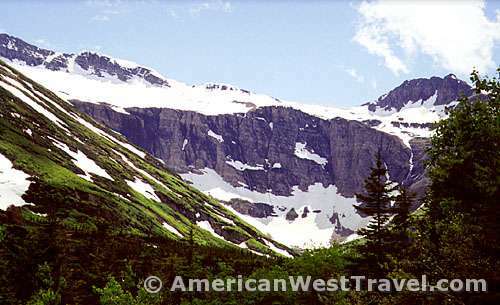 The best way to experience the wonders of the Many Glacier region and Glacier National Park in general is by getting away from the road and on the trail. 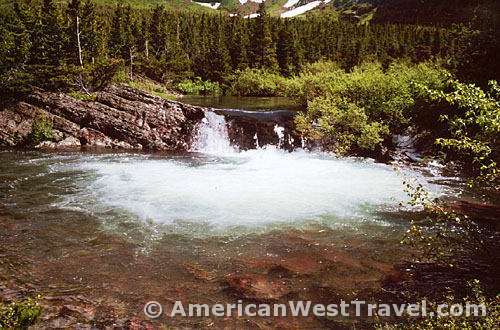 The Swiftcurrent Pass Trail transits a beautiful valley with numerous lakes and waterfalls between Mt. Grinnell and Mt. Wilbur. 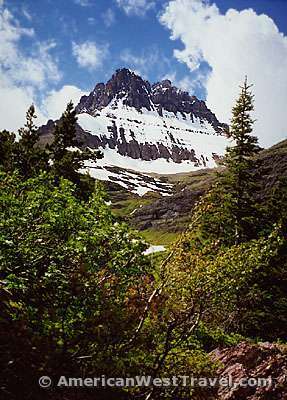 The photo, left, is a closeup of Mt. 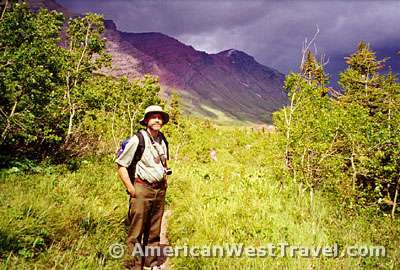 Wilbur, while the photo, right, is a true view from the trail. 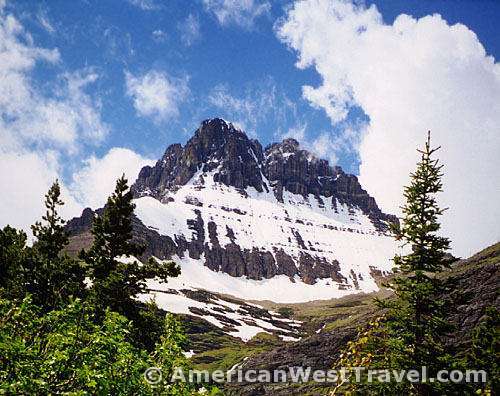 The trail eventually climbs 2,000 feet to reach the Continental Divide at Swiftcurrent Pass where the views are said to be astounding. Our day hike will cover only about half of the trail’s length today. 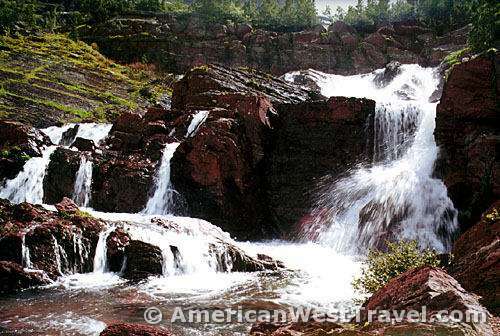 Our main goal for today is Redrock Falls, shown photo, left (and closeup, photo, right) flowing into Redrock Lake below towering Mt. Grinnell. Weather permitting, we will push on further. However June is still springtime here, and there have been periods of heavy rain every day. One hour into the hike, we get pelted with hail and then pouring rain. An hour later, we are down to shirtsleeves under a warm sun. 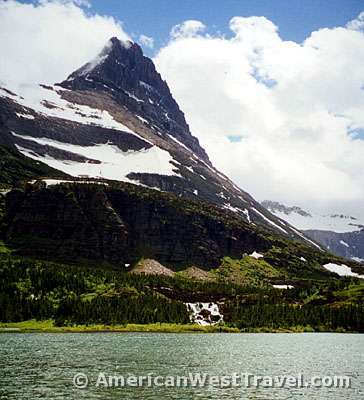 Glacier National Park is roughly bisected by the Continental Divide. The high mountains act as a rain shield. 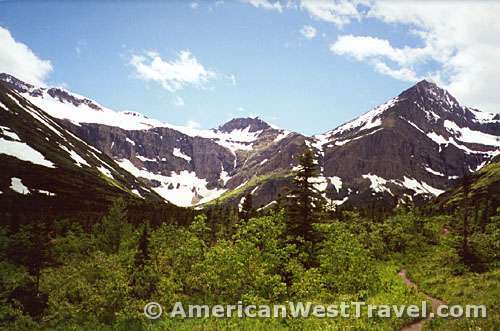 Hence the western part of the Glacier National Park is very moist and heavily forested, while the eastern side – which includes Many Glacier – is drier with more open meadows, grasslands, and deciduous trees like scrub maple. Thickets of lodgepole and ponderosa pine are common. Stands of spruce and other firs occur on mountainsides and higher elevations. In this northern region, timberline is rather low. The 9,000+ foot peaks in these photos are quite devoid of trees and vegetation. In the trailside photo, photo, above right, note the mixture of trees and meadowland described above. In the closeup, photo, above left, note how the high country rises up so abruptly. The vertical wall is easily over 1,000 feet high. 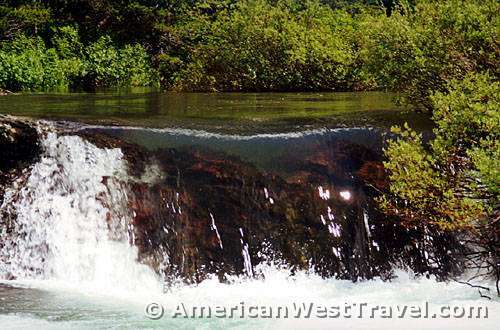 The highest vertical wall at the park is said to be about 4,000 feet, below Mt. Cleveland. Above Redrock Falls, there is a second, smaller falls (photo above right, and closeup, above left) which is also photogenic and fascinating. Look closely at the closeup, left, or check the enlargement. The water level is higher than the rocks. What’s holding the water in place? To my eye, the water is defying gravity! We hike a ways beyond Redrock Lake but the weather begins to look ominous again. Note, at left, Gerry is standing in bright sunshine with dark clouds lowering in the background. This is typical here but we decide to turn back. This is fortunate because it starts to pour after we get back to camp and continues for hours. When the rain stopped after sunset, we did have good fortune viewing wildlife.